Upper: Elasticated, one-piece knitted mesh. Cord based lacing. Midsole: Injection molded EVA variant, 4 mm heel to toe drop. Outsole: Carbon rubber pieces under toe and heel, injection molded EVA unisole. This is the shoe which the original 2013 Flyknit should have been. Snug, comfortable, flexible and lightweight. Last year’s Free Flyknit, which introduced the stretch upper on the 5.0 sole. 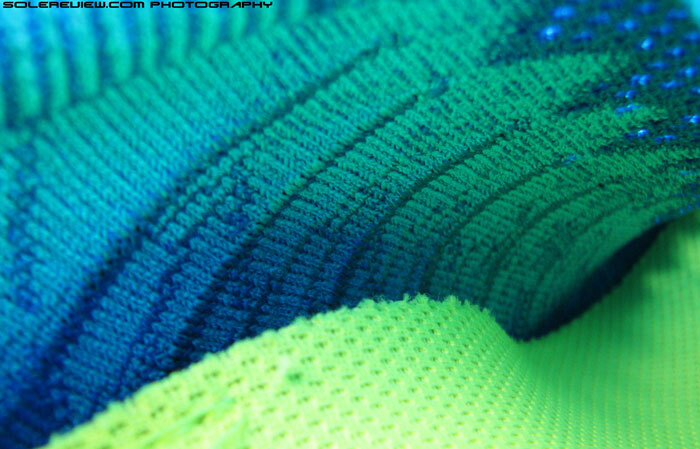 When it arrived, the 2013 Nike Free Flyknit was the first shoe to feature the compression version of the Flyknit upper. And that was followed up with the release of 3.0 and 4.0 Flyknits last summer, both of which ushered in new updates on the sole design. Look at the 2013 Free Flyknit and 2014 Free 3.0 Flyknit together, and you’d be hard pressed to tell the difference, at least visually. So, you would ask, what is the difference when it comes down to the fit, feel and overall performance? Not much, actually. Ok then, define not much. The entire Free line has always been a middle ground between regular shoes and all-our minimalism, and the 3.0 is no exception. For Nike’s most (supposedly) offering, the sole offers a lot of support. A quick summary would be – the Nike Free 3.0 Flyknit has a new sole design and profile, the collar bands feel a little more relaxed because of an increase in its circumference, and the overall shoe is lighter by a couple of Choco chips. And yes, $20 dollar cheaper too, which means there’s some money left for lunch or a few gallons of gas, whatever brings you instant joy. And do these small changes lead to corresponding advancements in performance? For that, you’d need to read our review, a task which will take you around five minutes, or till the time your limited attention span gets the better of you. 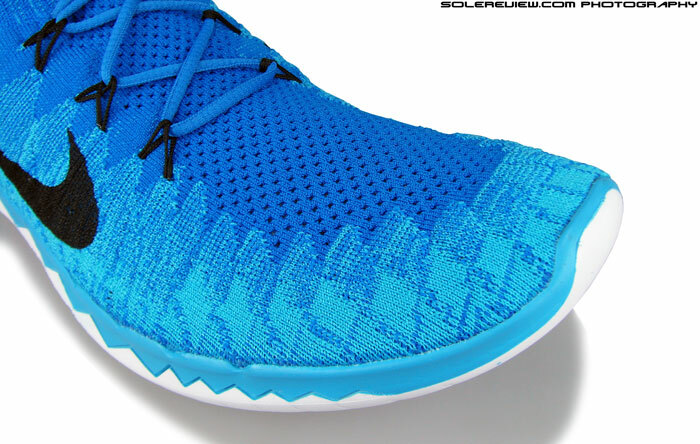 Very similar upper to the 2013 Flyknit, with only small updates. Runners familiar with the ways of Nike Free would know that Nike’s ‘barefoot’ offering has always been on the padded side, a far cry from zero drop shoes which dot online catalogs. Even in pre-Flyknit days, the Nike Free always came well damped, and rivaled many regular heel-drop shoes with its midsole profile. This design approach has been expanded across all Nike Free models, with the purpose of selling more shoes to a mainstream audience than zero drop enthusiasts. This has been, and is good news for people who wanted a lightweight, flexible shoe without the bone jarring experience typical of low-drop shoes shod with salt cracker-thin outsoles. Last year, the good folks at Nike decided to mate an all new, super snug Flyknit upper with then existing 5.0 Free midsole. We actually sent a question to Nike asking them why they did not consider doing that with a 3.0 midsole, or feature a brand new 5.0 sole design. The answer was that 5.0 was ’the best entry point’ for runners into the Free line, but as it turned out, a brand new sole design was already in the works, resulting in this year’s entire Free line-up showcasing major updates. So we had a point to begin, didn’t we? In retrospect, the original Free Flyknit looked like cobbled up in a hurry, hydrid-ising a brand new concept (stretchy Flyknit) with a somewhat stale (Old gen. 5.0 sole) platform. Fast forward eight months to April ’14, and the new 3.0 Flyknit launched with much pomp and splendor, along with its 4.0 sibling. 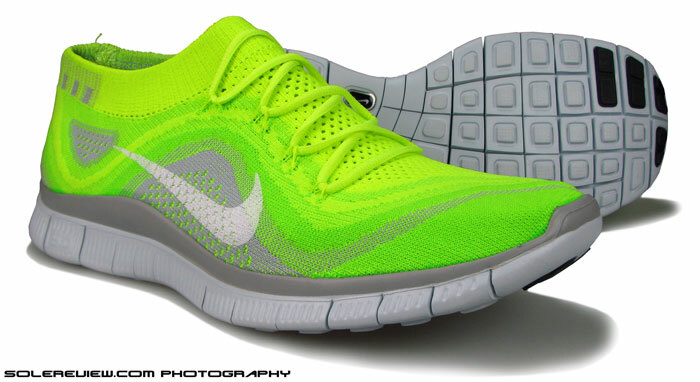 This also meant the gradual disappearance of the 2013 Nike Free Flyknit, so it’s safe to assume a couple of things. One, either this model is the replacement for the older 5.0 Flyknit, or there’s another 5.0 version of Flyknit in the pipeline? If we had to wager a dollar, option one seems more likely the case. Why so? 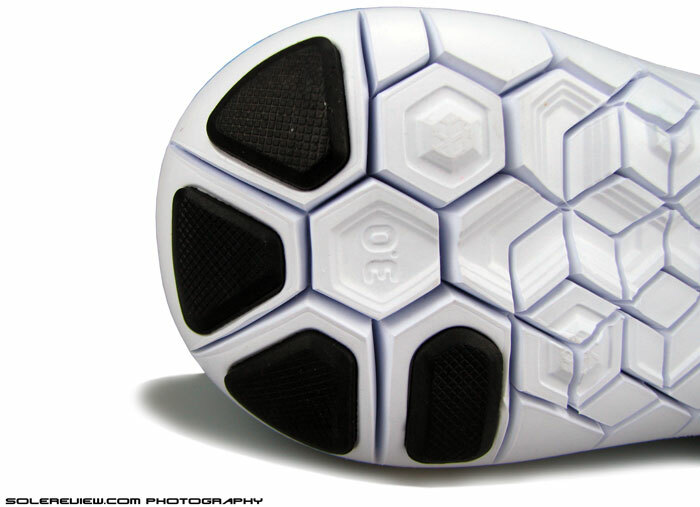 The new outsole design cuts across the entire 2014 Free line-up. It features a network of hexagonal pods separated by grooves. Because the Free 3.0 Flyknit doesn’t feel so much as the 3.0’s of years gone by. By which, we mean that it is not as flexible, as say a 2012 Nike Free 3.0 V4, and certainly not more than the Free Flyknit OG. Which is funny, isn’t it? Going by the 1.0 – 10.0 Nike Free hierarchy, the 3.0 should have been the barefoot-est of all, supposedly packing in a level of natural movement greater than upward numbered Free variants. 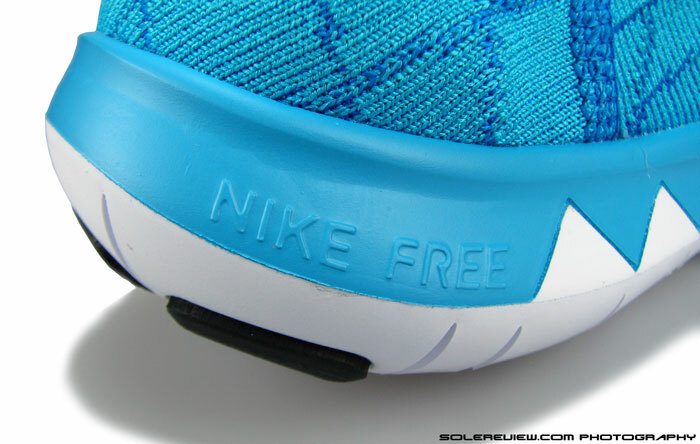 But it doesn’t, owing to the new Free 3.0 sole construction. The previous generations of Free had straight, left to right siping (grooves) while the new line-up swaps that for an arrangement of hexagonal shaped pods separated by deep grooves all around. This change affects the performance in a couple of ways, which we’ll care to explain below. Earlier Free outsoles were slightly more flexible because the deep cuts running sideways caused the under-foot area to splay wide with each flexing motion. The new geometry has marginally less flexibility, as the forefoot bending line has a combination of deep grooves and hexagonal pods. The flip side is that the heel to toe transition is vastly improved, with no flexing chasms to interrupt the ride. This improvement also applies to the 3.0 Flyknit, though its construction comes with a small caveat. The 3.0 midsole isn’t as generously cut as this year’s 4.0 and 5.0 platform, so forefoot flexibility is lower than the latter. We suspect that this is because of manufacturing ease; a more pliable midsole could have made the task of attaching the upper difficult. The 3.0 heel has an acute upwards flare. The four rubber pads converge together in mid-heel, making landings hard and abrupt. The open spacing around the hexagonal columns traps debris. The 3.0 Flyknit comes with a noticeable heel flare, one end of the shoe prominently rounded up. Nike says that this allows gradual transition, but we felt quite the opposite. The flare encourages a mid-heel strike, which is good, but the landings feel hard at the point of foot-strike. There are four pieces of rubber on the heel, and their narrower ends converge right at the foot-strike point. So when you land, these hard edges are felt, and the process seems abrupt instead of gradual. Very noticeable when you’re wear-testing the original Free Flyknit, the 4.0 Flyknit and this shoe together. Another effect of the flared heel is that the grooves around the hexagonal foam pods flare wide, exposing gaps around each pod. These corners ‘catch’ on the running surface, and see quick wear till they are slightly blunted. The initial run in the 3.0 Flyknit is slightly noisy if you’re using them on track, where these edges momentarily catch the synthetic surface. They get better with time, though. Bigger gaps also means an increased opportunity for debris to get in, and sure enough, some small pebbles were lodged in the heel after a few sessions of road running. 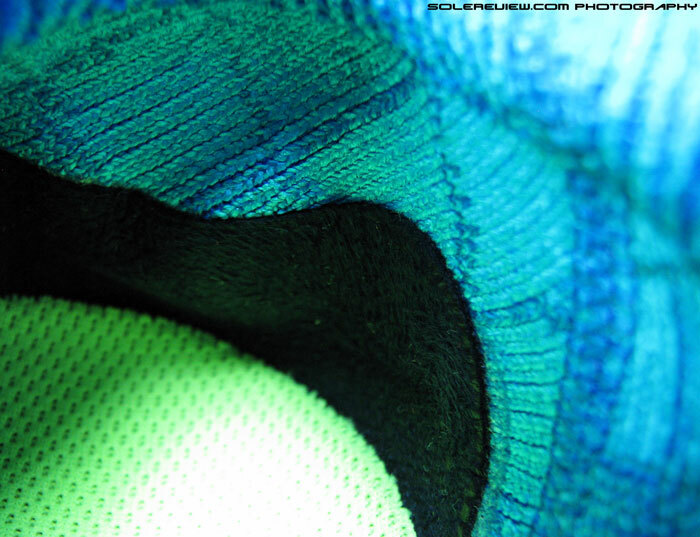 The medial (inner) side of the 3.0 Flyknit midsole does not have an arch flare. Would have been nice to have it – the 2014 Free 5.0 features it. 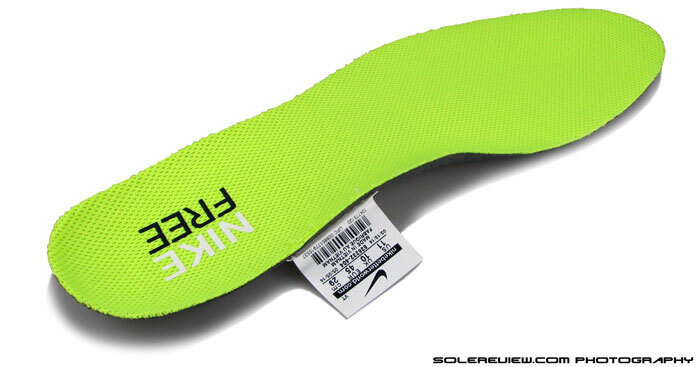 We would like to have seen the midsole arch curve which is part of the 5.0 midsole. The Free 3.0 and 4.0 midsoles don’t feature this design aspect, and the midsole wall edges shoot relatively straight up. Wasn’t a bother during any of our test runs, but it could be for runners in cases where the foot arch tends to sag over. In the forefoot, the width is narrower than last year’s Flyknit and current 4.0 and 5.0 versions, and the snug upper keeps the foot pinned down. This narrows the forefoot pressure down to a smaller area, making push-offs more focused. This is a trait commonly found in distance racing flats, so the Free 3.0 Flyknit works well for intervals too. The grip? It is average, not particularly impressive, but doesn’t slip. The one piece upper is joined by a single zig zag seam. The Flywire loop count is down to three instead of four in last year’s Free Flyknit. See those channels on the left side? That’s the tunnels through which the lacing cords pass through. Upper fit is near identical to the 2013 design. 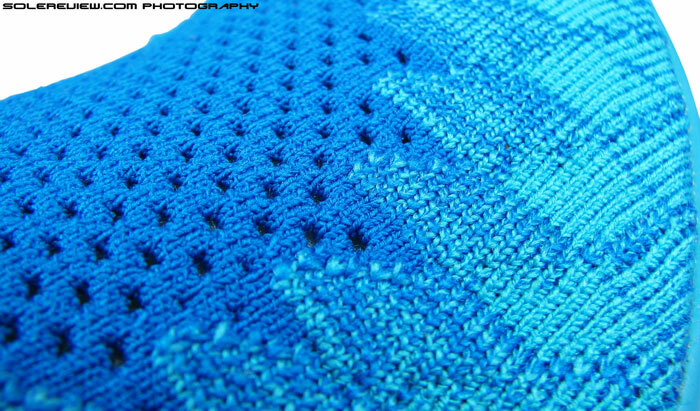 One piece knit upper, joined only by a seam in the medial heel. If there was shoe which could be described having a ‘seamless’ fit, the 3.0 Flyknit could certainly be called one. The interior is truly without layering, minus the lining and other components typical of traditional shoe making. But the Flyknit isn’t traditional, a single piece stretchy upper tugging at both sides of the midsole, making them point skywards. The upper volume in its un-stretched state is smaller than the foot it has to cover, so when you put them on, its snaps tight on all sides without slack. There’s Flywire loop lacing in the mid foot, but as the cords travel through ‘tunnels’ and avoid direct contact with the skin, there’s no irritation or localized pressure. Staying true to the changes in other Flywire based models, the number of anchor points have been reduced. 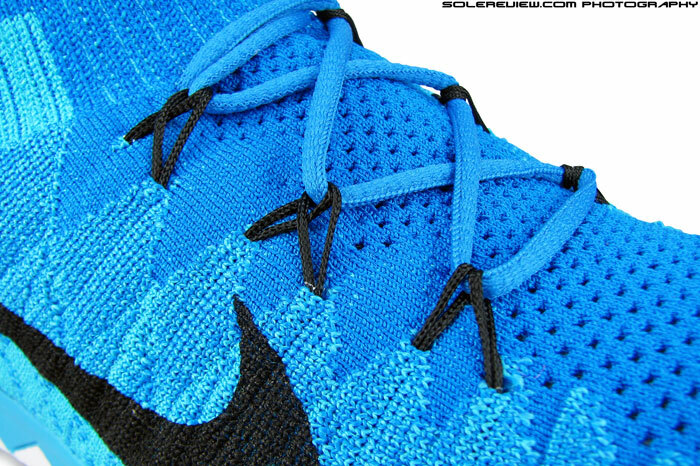 The 2014 Free 3.0 Flyknit has only three lace-loops with a more spread over layout, compared to four loops of the previous Flyknit. The 3.0 has a pointy tip, but the upper features more of ventilation pores. Sizing is true to size here, and more so than the 5.0 version – with some updates. The 3.0 Flyknit forefoot is a little pointy in comparison. The older 5.0 toe was squared-off and flat in the front, while the 3.0 has more rounded midsole tip. This affects the room available ahead of the smaller toes; the 5.0 had some forward space in front of the second and third big toe. In the 3.0, there is still some room on one side, but the space is at an overall premium. 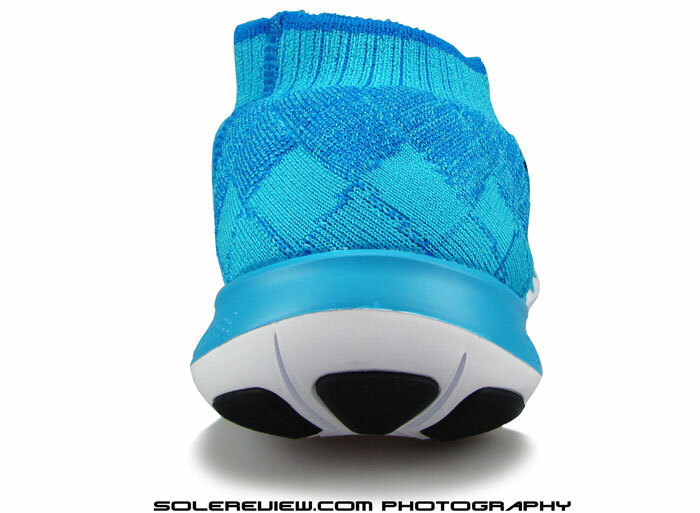 Technically, the forefoot widths of the 5.0 and 3.0 are the same, going by the sockliner (insole) dimensions. That said, the upper stretch feels better over the foot, with the 3.0 Flyknit upper featuring a much larger panel with ventilation pores on them. This sits right atop your foot, so side to side stretch pressure has a more gradual delivery. Still very snug, but you can tell the difference between both. 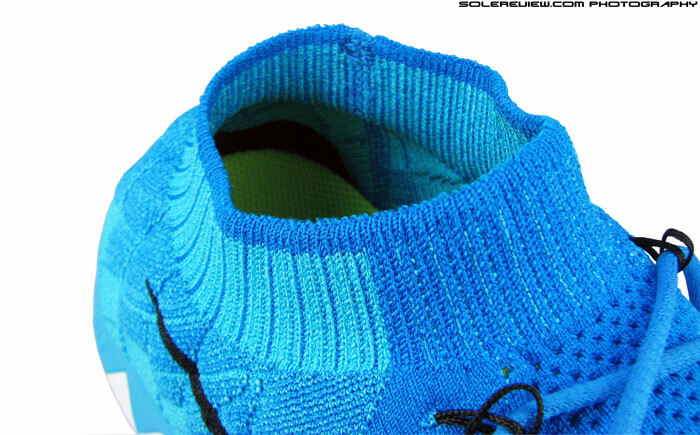 Collar is more relaxed compared to the 2013 Flyknit upper. A patch of micro-fiber lines up the ball of your heel. A sure-fire solution for irritation. Expanding on the point we made at the start of this review, the collar bands have a better quality of fit. The radius of the collar opening is increased by at least 5 mm, so the pressure is less acute while still being quite snug. On a related note, the heel fit is narrower than the Free Flyknit 5.0, and the upper wraps tighter on the lower part of the heel, both medial and lateral. This is due to the change of the midsole design, which modifies the base of midsole heel. 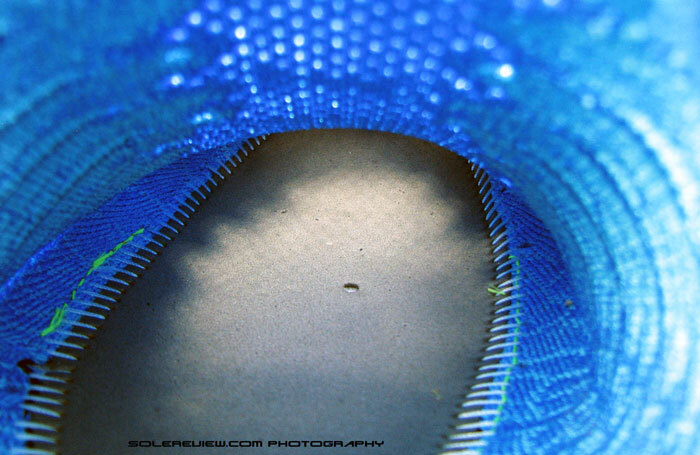 Inside the upper heel curve, a soft microfiber fabric is glued on without seams, to prevent any chafing. Interior is seamless. Which means you can run around barefoot naked. The Free Flyknit 3.0 is best worn without socks, as was the case with the 2013 Flyknit. No seams make the interior environment pleasing to the bare skin, and if you find the Flywire cords a bother, you can remove the lacing and still retain the Flyknit’s unique compression behavior. For non-speedwork runs, barefoot and no laces go together just fine.If you choose to wear a pair of socks, a half-upsize is in order. And if you want a relaxed fit (leaning towards the 4.0 Flyknit), then it’s half-up size in barefoot and one full size with socks. Ortholite footbed is comfortable, but sticks to your sole after a run. There’s only one drawback of using the Flyknit barefoot. The Ortholite foam insole is soft and comfortable, but the snug forefoot pins the foot to it, making it stick. When you try to take the shoes off, the foot’s not the only thing coming out – the sockliner tends to slide back and curl upwards in a bend. Minor niggle if you’re going to wear this shoe without socks. Would have preferred an integrated footbed, a good example of that would be the Under Armour Speedform Apollo. The Free 3.0 Flyknit is lightweight. At a US 11 weight of 217 gms or 7.6 Oz, it beats a lot of featherweight competitors hands down, including racing flats. When pitched against the now discontinued Free Flyknit, it is lighter by 10 grams, but remember that last year’s shoe had the Nike+ cavity. So taking that out alone would have helped the 3.0 from a weight perspective. The patterns are raised up, giving the design more depth. Still comes with a screen printed Swoosh. A knit logo would be nicer, wouldn’t it? Looks are subjective, but we’ll chip in with what we think. While last year’s Free Flyknit upper design tried to mimic overlays of a shoe upper with its flowing lines, the 3.0 Flyknit breaks free and goes somewhat freeform. The upper patterns look vaguely inspired by native American design elements – like Pendleton meeting Nike N7. 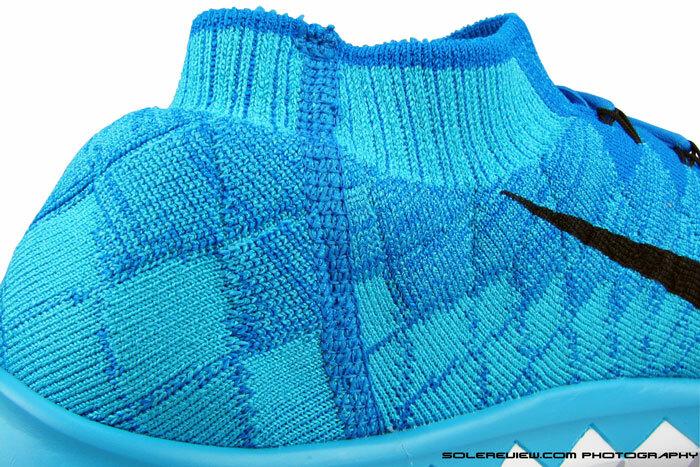 The texture of the knit upper isn’t flat, like the 2013 Flyknit. A series of geometric shapes cover the surface, and they are thicker and raised above the rest, giving the design a depth which was missing last year. 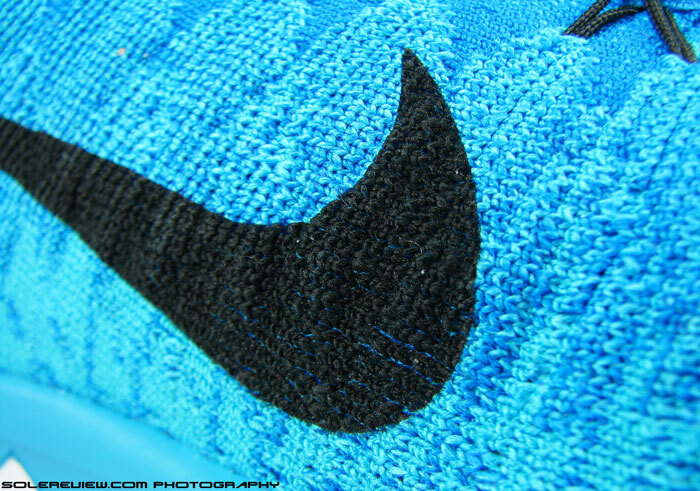 The Chlorine blue color we’re reviewing looks amazing, though Nike continues to use a painted on Swoosh logo. It is in black, and doesn’t look off, but it will be great to see a logo actually knitted in. If you have the original 2013 Free Flyknit, then it isn’t worth upgrading to the 3.0 Flyknit, because it’s 80% the same. 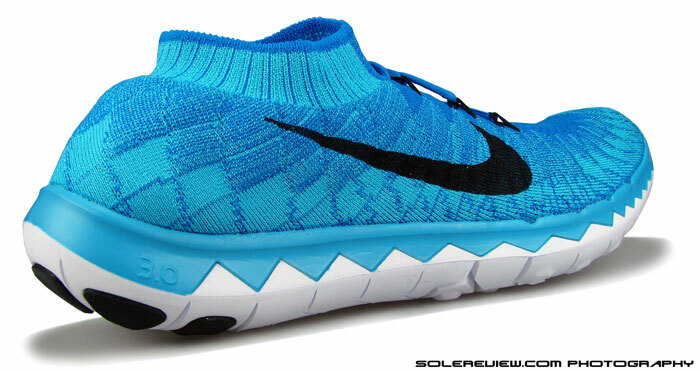 And if your fingers itch to add a Nike Free Flyknit to a digital cart, then do consider the cheaper 4.0 Flyknit too. Naturally, you’d need to go to a store a try both first. The 4.0 Flyknit has a semi-compression fit, with a lot of forefoot room and foot splay, which means you can wear socks with them. The 3.0, on the other hand, still delivers a unique feel unequaled by anything else on the market. Super snug, reasonably padded, and best worn barefoot. You don’t need socks because, well, the Free 3.0 is for all practical purposes, a pair of thick socks with an outsole. And you don’t have to be scared of the 3.0 tag, because the shoe is a few miles away from full scale minimalism. The padding’s there, the 4 mm drop doesn’t load your calves as much (as a Vibram), and the upper design looks pretty dope too. It’s like having a low calorie sub with fries and a shake on the side. Note on ratings: Our numeric scoring of 7.3/10 is based on a total of weighted averages. The attributes namely transition, stability and fit contribute to 69% of total scoring weight, which we see as more important than material (7%), cushioning (7%), traction (12%) and weight (5%). Hence the scores will not add up when simple average calculation is used. So, these are basically the same as the 2013’s, save for a hexagonal outsole, a less tight collar, and $20 less? Love to see all the Free reviews to see the contrasting changes in each shoe. Yes, you’ve summed it up well. so which free flyknit should i buy??? Depends on what you’re looking for in a shoe. What would that be? I need shoes for running a marathon outdoors, on pavement. Would these shoes be suitable? They would work, but then there are better shoes (Streak 5, adidas Boston 5, etc) to run a marathon in. What have you been wearing so far? Hi,i just wanna ask which one is more ventilated among free 3.0 flyknit,free 4.0 flyknit,free 5.0? 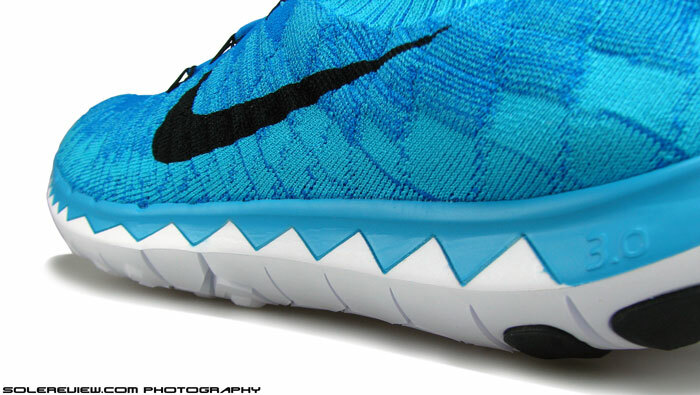 The Nike Free 4.0 Flyknit, that would be. are these shoes good for doing sprint work on a track? if not, what type of shoes is good for that? We’d would look at something like the Nike Zoom Streak 5, Streak LT, Nike Lunaracer 3 or the new Lunar Tempo. These do well for track training. I’m looking for trainers that would be good for heavy dancing indoors. I wanted something that was very lightweight and comfortable but still gave me a little support; I’ve been looking at the Flyknit range, would you say the 3.0s are suitable/are there any others you could recommend? We would go with the Nike 5.0’s for its wider base – try the latest 2015 one, they are improved over last year. The soles are also non-marking for most part, so those leave little or no marks on hardwood, in case you practice on such a surface. What’s the thickness of the sole? Have no idea. Nike has not published it, and we haven’t measured it. I am looking for shoes for running marathons, and i train mostly on the road (not mud/clay) basically meaning more hard floor. Would these be good for the road ? What will be the life of these (kms) ? If not, can you suggest some other options ? How about getting the Nike Lunar Tempo, that is a good shoe for running long while maintaining pace. If you want something more cushioned, then the Pegasus 31 will do it for you. A typical free outsole should give you around 300 miles/500 kms, but it can be longer or slightly shorter depending on your weight, running style, temperature and running surface. You could try the Nike Lunaracer 3 or the Nike Lunar Tempo. Really light shoes which feel good for track training. That’s more than a marathon’s distance of walking per day. Wouldn’t recommend the Free, instead buy a shoe such as the Vomero 10. Much more comfortable, with a spacious upper. Or better still, one of the purpose built walking shoe models from New Balance. hi just wondering if you are mentally stable. Should i remove the insole ? Does it lose any features like the lunarlon insole ? Because it is way more comfortable for me when i’m wearing the shoes without it. By all means, do it – if it is more comfortable. I currently wear Five Fingers but when running longer distances I wanted a little more padding. I used to be a heel striker now a midfoot. Would you recomend a pair of these? These will do just fine, but worth trying the Free 4.0 Flyknit too.